I never tried growing potatoes at home until reading you wax poetic about them. This year I grew Yukon and Kennebec, and they were awesome. They are also easy to grow and store. 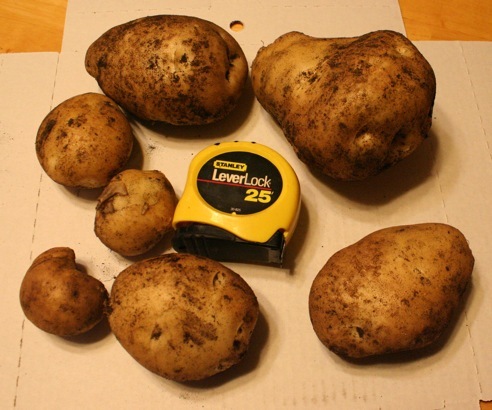 Yes, we tried Kennebecs last year, the first year we grew potatoes. They’re out there in the ground now, I hope safe from the blight. Have yet to dig any of those. They’re a great variety. kennebec is going in next year. Without irrigation and small fert input these should do alright- otherwise I would worry about keeping & quality. Good to hear good news- sorry about the blight. Farming is so full of unknowns. We really should all have an annual income set aside to get thru hard times…. Most of these went to the food bank, but a fair few are “down cellar” to test their keeping quality in a big tub of slightly damp peat moss. My record is now 1 lbs 1.25 oz. Purple Viking. Obviously not the same ballpark, but it sure is exciting to find big ones isnt it.